Portland proper isn’t the only foodie haven on Casco bay. Just a ferry ride away, the islands are scenic spots for scrumptious coastal dining. Freshly picked vegetables and herbs bring out the best in pastured chicken. Reader-submitted Maine recipe. An unusually delicious pairing of Maine blueberries and Maine dulse. 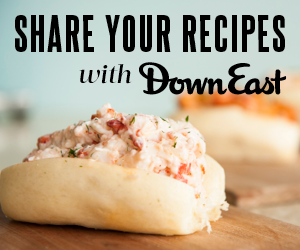 Share your favorite Maine-inspired recipe and it may be featured on our website! Brian Beggarly and his wife, Molly Eddy, purchased Camden’s popular breakfast and lunch spot, Boynton-McKay Food Co., a year-and-a-half ago. See how they’re putting their own stamp on this beloved small-town institution. A simple, wholesome meal evokes summertime in Maine. See Annemarie Ahearn’s recipe for Tomato & Bread Salad. Share your favorite Maine-inspired recipe and it may be featured on our website! It’s easy. Enter your recipe info and pictures, and tell us a little bit about yourself. Then, let the Down East community see your delicious creations. Another year, another Down East Best of Maine Readers’ Choice poll. Some 5,000 of you cast a ballot this year, and you’re an opinionated bunch. The results include some newcomers in their categories and some stalwart shoo-ins that just can’t seem to lose. Berries with biscuits and cream evoke memories of carefree days. Try this Maine recipe for biscuits with summer berries. The menu at Mill 67 is heavy on the comfort food of Jim Paquette’s Franco-American heritage. On a recent visit, duck poutine was an irresistible appetizer special. Read our review of his gorgeous new restaurant in the Sanford Mill. Any old bar can pour you a pint. Where do serious beer lovers settle in among their tribe?